After looking at some parts, I realize I might have one of the last ZHP sedans produced. KM02738 11/14/2002 sedan FIRST ZHP? KM07539 05/18/2004 sedan Go Horns! 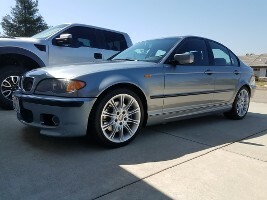 2003 BMW 330i ZHP, 6mt, Silver Gray/ Black leather. Anyone know this part number? Part number sleuths, I need your help!